I believe when Paul says, “I am persuaded…” in Romans 8:38, he wasn’t speaking from his well-educated theological understanding, he spoke from deep-down-personal-gut assurance. 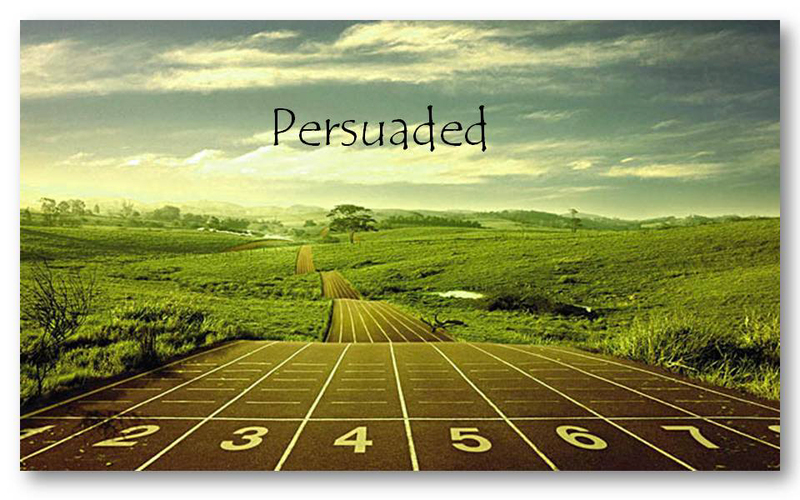 Persuaded, we see this also in the life of David. Remember in 1 Samuel 24 when David and his men were hiding in a cave when in walks Saul (um…to relieve himself). David was encouraged by his men to take the opportunity and kill Saul and he’d finally be king. However, David didn’t. He did cut off a corner of Saul’s robe, but even in doing this David was troubled in heart. When Saul was leaving the area, David went out and called to Saul, “My lord the king!” When Saul looked behind him. David bowed down and prostrated himself with his face to the ground…” (v8) In that moment David’s heart was ‘persuaded’ (conviction is not only pointing at the wrong but also points to the RIGHT) his heart was won over by the amazing certainty of God. He didn’t HAVE to kill Saul. Who was he to push his hand, to attempt to push God’s. God’s purposed plan. Persuaded. His-timing-is-perfect! THIS is what Paul is saying, he like David is won over by the amazing certainty of God, that “Neither death nor life, angels or demons, present or future or any powers high or low, indeed nothing in all creation can or will be able to separate us from God’s love – His willful – active good on our behalf whether we deserve it or desire it! (Romans 8:38-39, paraphrased) Persuaded. God-loves-us! James and Jude, two brothers of Jesus, John gives the account of the brothers trying to push Jesus out there for popularity sake and a personal jab of sorts, “You can’t become famous if You hide like this! If You can do such wonderful things, show Yourself to the world!” (7:4 NLT) In the same pen stroke, “For even His brothers didn’t believe in Him.” Yet, years later, both brothers open their letters with “a bondservant of God and of the Lord Jesus Christ…” What was it that took them from unbelief to full surrender to Who Jesus is? Persuaded. He-is-Lord! I am challenged by this, what areas of my life is there hesitancy, where do I stop short in my confidence in God. I ask of you the reader the same of myself: What WILL it take for us to be persuaded, being won over by the amazing certainty of God? Knowing with a deep-down-personal-gut assurance that His timing is perfect, He loves us, He is Lord and live the “I will” lifestyle of obedience. Whatever expectations we might have, whatever prerequisites we may have mentally listed, let’s lay’m down, giving full surrender to Who Jesus is.